What time is it? It's KAL time! ...well, almost! As we missed out on an autumn kal, our last knitalong finished five months ago! That's far too long. It's time to decide what should be the theme for our first KAL of 2014, so we can start planning. So far we've had a couple of pattern-specific kals (Stripe Study Shawl followed by Color Affection), then the Next Step Sock Knitalong which was about personal progression (that was my favourite so far) and most recently the hugely popular Pick-a-Boo kal which was designer-specific and produced some amazing FOs. So what do you fancy next? I have a few ideas of my own but would love to hear what you all think. You can either leave a comment below, or head on over to the Ravelry group where there's a new thread. Can't wait to see what you come up with! I found that great photo here, artist unknown. 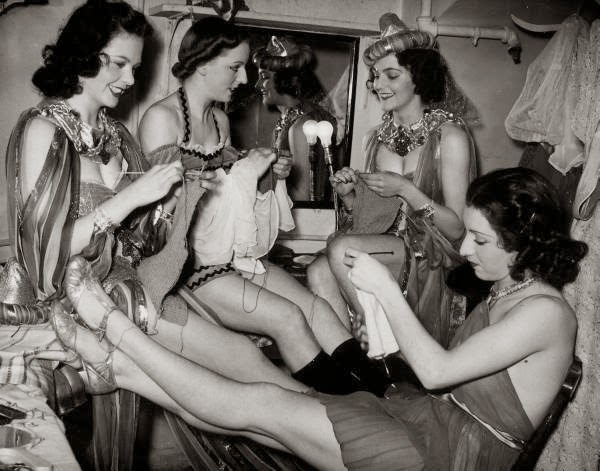 I am sure all the kal participants are at least as glamorous as this while knitting along! At least as glamorous....sometimes with a tiara too. I would love to join in another KAL, but have no ideas....I've really enjoyed knitting all the things I've done on your KALs previously as they've all been challenging but I've learnt lots too....i look forward to what ideas there are....I do want to learn some fairisle or intarsia this year....i really like that Kate Davies rams and ewes stuff, but I think that may be a ers0onal challenge!